Brutal, dramatic, unrelenting: epithets that have all been used to describe Giacomo Puccini’s tremendous historical opera, Tosca. Set in the real Rome of the Napoleonic Wars, its locations still stand today, including the Church of Sant'Andrea della Valle, the Palazzo Farnese and the Castel Sant'Angelo. In Tosca, politics and warfare provide the backdrop to a torrid tale of jealousy, passion and murder which sees the characters destroy each other and themselves; an opera in which there are no heroes, only victims. Angelotti is a prisoner on the run. 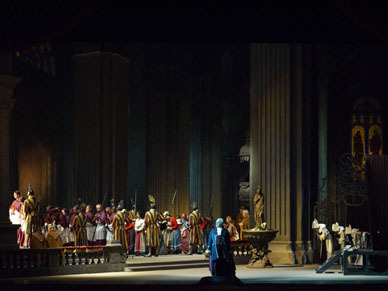 Tosca grows suspicious of her lover, Cavaradossi, after mistakenly thinking he is concealing another woman rather than offering Angelotti his protection. Scarpia, the chief of police who has his own designs on Tosca, exploits the situation, first by threatening Cavaradossi with torture in an attempt to force him to reveal Angelotti’s hiding-place and then by striking a bargain with Tosca to spare Cavaradossi from execution if she agrees to become his lover. Scarpia’s reward for his treachery is death at Tosca’s hands, but as Cavaradossi stands before the firing squad, there is still an unexpected turn of events that even Tosca cannot prepare for. Despite an indifferent critical reaction, the opera was an immediate success with the public who loved both its melodrama and Puccini’s renowned gift for melody, of which “Recondita armonia” (“Hidden harmony”) and “E lucevan le stelle” (“And the stars shone”) are just two examples in this wonderful work. Premiered on 14 January 1900 in the Teatro Costanzi, also known as the Teatro dell'Opera di Roma, Tosca comes to the stage of the Vienna State Opera in all its blood-stained, tainted glory.